Product code: ES6572 Categories: Sold Items, Sold Rings. If you have been looking for a genuine Art Deco diamond engagement ring, then consider this one as it is just so beautiful and elegant. 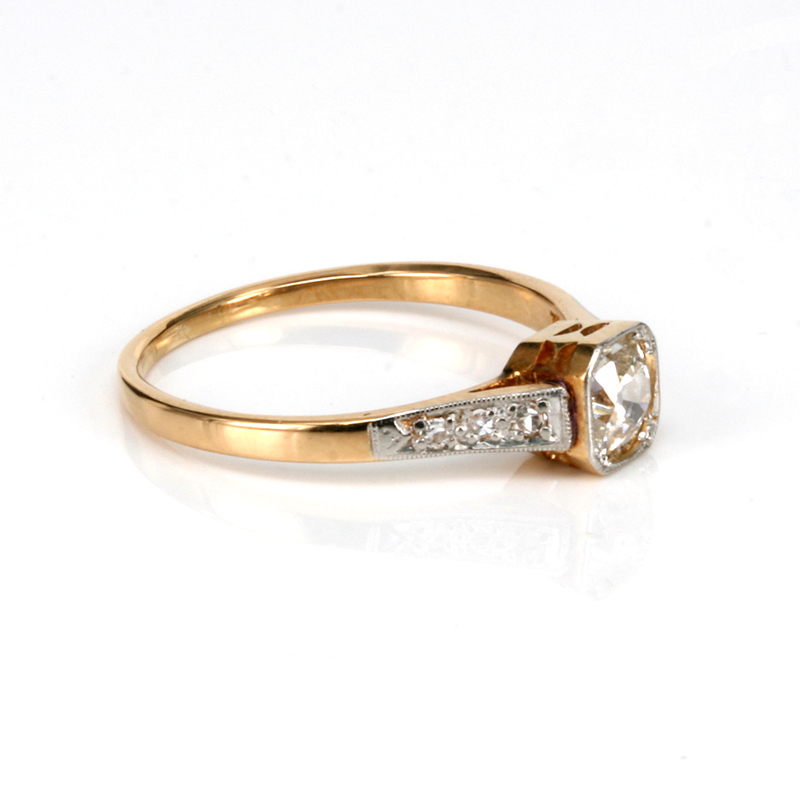 Dating from the 1920’s, this ring was hand made in 18ct gold and platinum in such an stylish design that looks as good today as when it was made all those years ago. Quite often in Art Deco jewellery you get a “shape in a shape” and here this is evident with the centre round diamond set into an hexagonal setting. This centre diamonds measures 0.65 carats and is G in colour and Si in clarity meaning that it is in the white range of diamonds without any eye visible inclusions. Having all the extra charm and character of being a genuine Art Deco engagement ring just adds to the beauty and character. Then down each side are three diamonds with a total weight of 0.06 carats that adds the right amount of sparkle without making this too ostentatious and keeping in the refined character of a fabulous bygone era. From the end of the side diamond on one side across to the other, this distance measures 17.95mm across by 5.95mm wide at the centre and will sit perfectly next to an wedding ring. Art Deco diamond engagement rings always seem to have that something extra about them, from the design to the quality and this engagement ring has it all.